The ultimate Maine classic. Ideal for the fall and winter seasons, this flavorful pot of gold should serve 8. Heat a large Dutch oven over medium-high heat. Add oil; swirl to coat. Add lobster shells; sauté 6 to 8 minutes or until shells begin to brown. Add onion and next 4 ingredients (through bay leaves); sauté 5 minutes. Add garlic; sauté 2 minutes. Stir in tomato paste; cook 1 minute, stirring constantly. Add vermouth; cook 2 minutes or until liquid evaporates. Stir in stock. Add enough water to lobster juices (see headnote) to equal 3 cups. Add to pan; bring to a simmer. Reduce heat, and simmer 15 minutes. Strain mixture over a bowl; discard solids. Return stock to pan over medium-low heat. Stir in cream. Combine 1/2 cup water and flour, stirring with a whisk until smooth. Add to pan; cook 2 minutes or until bubbly. Stir in lobster meat. Cook 2 minutes or until heated. Sprinkle with chives, if desired. 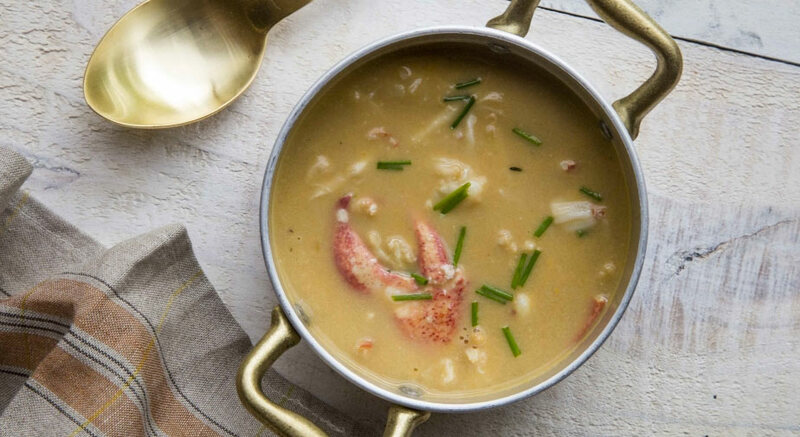 Note: When removing the meat from the shells, do so over a bowl and use the lobster juices in the bisque. Special thanks to our friends at Cooking Light for the recipe and Teresa Sabgafor for the photo!